Tennessee may be one of the smaller United States, but it is one of the more populous and has made quite an impact on the nation overall. Nashville remains a cultural center and a mecca for musicians; Memphis and other major cities hold historical and political significance. When it comes to natural landmarks, Tennessee offers a number, from the Mississippi River to the Great Smoky Mountains. The National Park Service protects many important scenic spots, such as the Cherokee National Forest and the Trail of Tears. In a state with so much to protect, converting to solar power is certainly a bright idea. For over 80 years, the Tennessee Valley Authority (TVA) has been deeply entrenched as the primary electricity utility. However, TVA is doing its part to motivate customers to go solar. 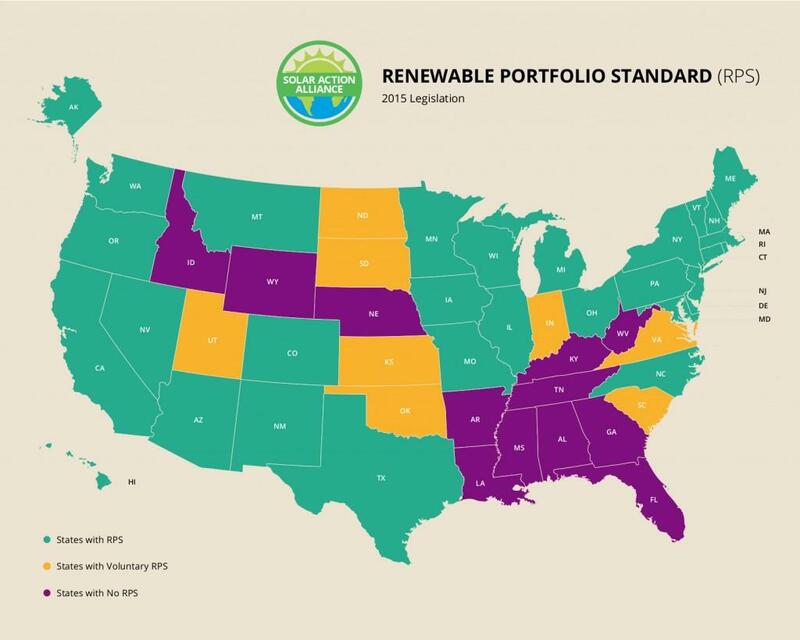 Surprisingly, the roadblocks are coming from state legislators, who have yet to create a renewable portfolio standard (RPS) mandating partial reliance on renewable energy sources. Additional incentives and policies are lacking in Tennessee as well. If there’s a positive to this story, it’s that Tennessee has the capacity to make great strides when it comes to the solar energy industry. You can still benefit by installing solar panels on your home. Let’s look more closely at what the current situation means for you. If you’re considering installing solar panels, your primary concern is understandably the price. 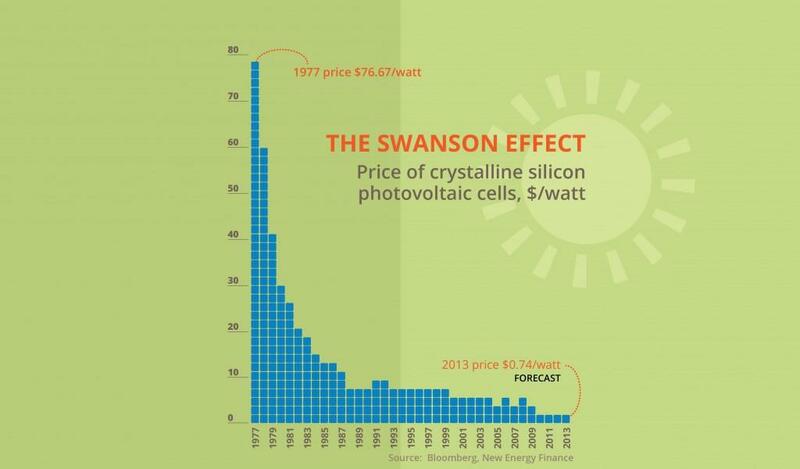 If you look at the Swanson Effect graph above, you can see that the cost of solar started out very high decades ago. Within the last couple of years, that cost finally dropped below the cost of coal-generated power—and it will continue to drop. Tack on a massive federal tax credit for your installation and a $1,000 rebate from TVA, and it’s clear that solar panels are an excellent investment. Read on to find out more about the potential return on investment (ROI) for a solar energy system in Tennessee specifically. In Tennessee, electricity is inexpensive, but because there’s plenty of sunshine, you can still save a lot of money by switching to solar. 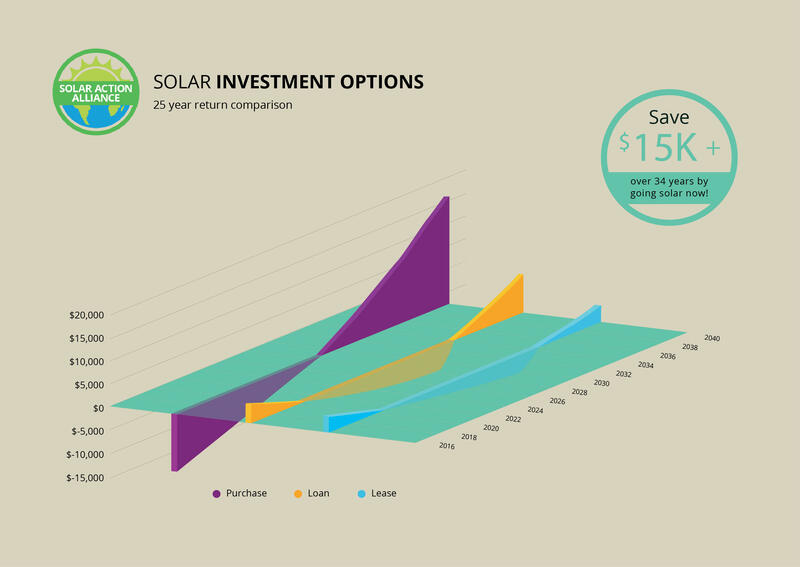 The graph above will help you visualize the 25-year ROI for solar panels in Tennessee. We’ve calculated three purchase options: one with cash and two with loan funds. Regardless of your choice, you’ll get a 30 percent credit on your federal tax return and the aforementioned TVA rebate after installing your panels. 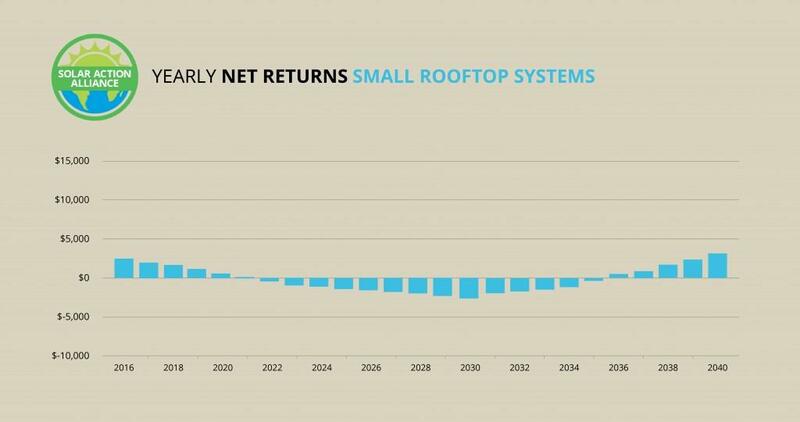 As you might expect, paying for a solar installation with your own money generates the biggest returns. That’s because you won’t be paying any loan interest. In Tennessee, it takes 14 years to recoup your initial outlay. For the next 11 years—or for the remaining warranty life of your panels—you’ll make money and end up with over $16,000! If you don’t have cash but you do qualify for a loan, you can install a large (5-kW) or small (2-kW) system and still reap financial benefits while helping the environment. Your federal tax credit and TVA solar rebate will cover your loan payments for the first several years. After that, you’ll be paying principal plus interest for some time, but you’ll eventually come out ahead. You can find out more about each option below. There was a time when the only way you could switch to solar power was to fork out the cash yourself. 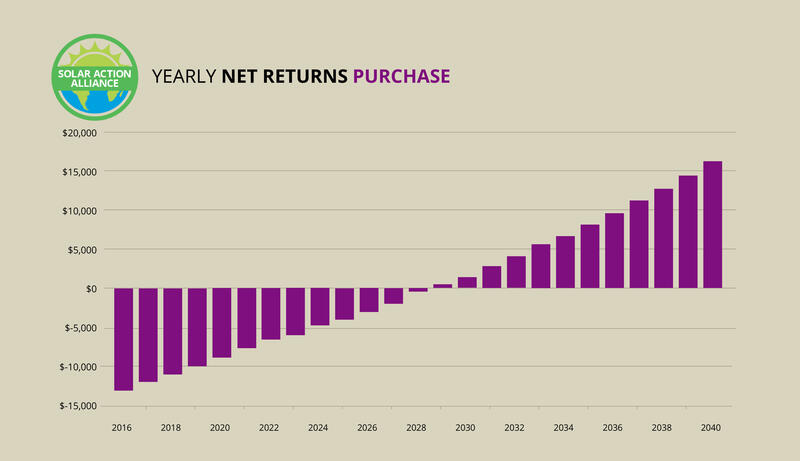 While things have changed, an outright purchase is still the most lucrative way to invest in solar. As you can see from the graph above, however, you’ll need quite a bit of cash to go down this road. With $20,000, you can get a 5-kW system solar energy system installation in Tennessee. You’ll own your system from the first day and have total control over your power. In the way of financial bonuses, you’ll receive your solar tax credit for 30 percent of the purchase price from Uncle Sam. Additionally, you’ll earn performance payments and get a rebate from TVA. Let’s not forget the savings on your monthly utility bills! By the time your solar panel warranty expires in 25 years, you’ll have earned $16,000. No cash? No worries. 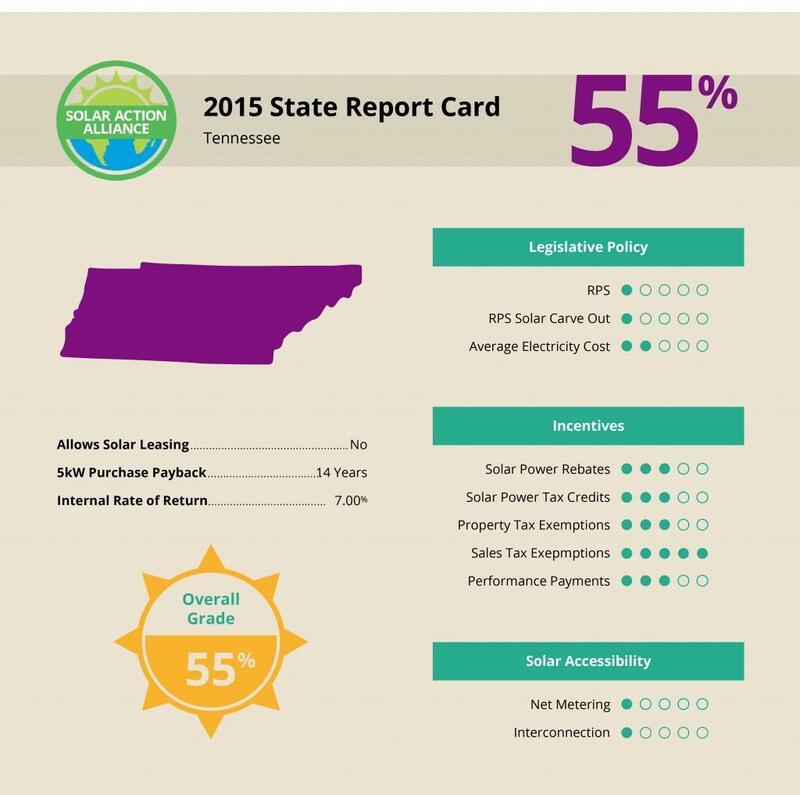 Solar panels in Tennessee are just a home-equity line of credit (HELOC) away. Look for a HELOC with a repayment period of 15 years and an interest rate of 5 percent or less. With no money down, you’ll earn your 30 percent tax credit like everybody else, plus a rebate from TVA. That first year, you’ll start out ahead of the game and have some money to cover your loan payments for the next few years. As you make your payments over the total of 15 years, you’ll be spending more than you save, but consider each payment an investment in your future—just like a retirement account. Your ability to delay gratification will pay off in the long run. Once you’ve repaid the loan, you’ll own your system and be able to see the savings. Those savings will rack up to over $8,000 by the time the warranty on your solar panels expires! If you have less home equity or slightly weaker credit, you may be able to take out smaller loan. For about $8,000, you can install a 2-kW solar power system in Tennessee and still win in the end. On top of the monetary gains, you’ll be reducing air pollution and beautifying the earth. There’s nothing to lose! 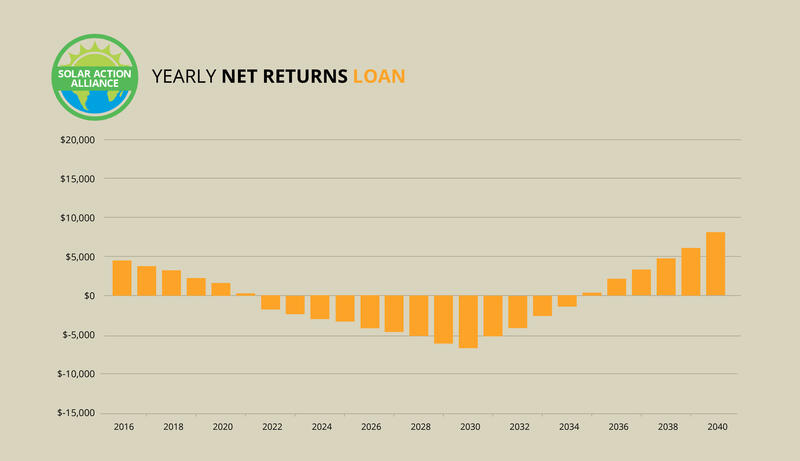 In the graph above, we show how an $8,000 HELOC at 5 percent interest, with a 15-year payback period, can generate almost $3,000 over 25 years. Even with a small loan, you’ll still get the first-year federal tax credit for your installation. Moreover, even though you’ll be generating less power with a small system, you’ll still see savings on your energy bills. An RPS is a mandatory standard with which utility companies must comply. The RPS details the percentage of energy that must be produced by renewable sources, and states a deadline. Utilities that fail to comply must pay stiff penalties, so most such companies are highly motivated to play by the rules. Many states have set lofty goals for the conversion to clean power sources such as wind and solar. Sadly, Tennessee has no RPS and no explicit aspirations to move residents and businesses closer to renewable energy. The reasons for the state’s inertia are not clear, but it is clear that Tennessee’s energy policies could use some overhauling. Tennessee is unique in its position on power. The creation of the TVA was a revolutionary move by FDR, and there is no other agency like it in the United States. TVA’s numerous hydropower facilities provide electricity at a low cost to residents of Tennessee and surrounding areas. Moreover, TVA does offer a $1,000 rebate for solar panels through its Green Power Providers program.